The events service provider A&O Technology from Oyten is setting a furious pace in the New Year, having already furnished equipment for numerous high-calibre events. These included the inaugural celebrations for the new American president, Barack Obama, which featured German-made FALCON searchlights. Over 400,000 people attended the open-air festivities at the Lincoln Memorial in Washington D.C.. 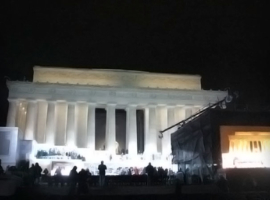 The show, entitled “We are One: The Obama Inaugural Celebration” , boasted a host of internationally renowned artists that included Beyonce, Bruce Springsteen, Herbie Hancock, Sheryl Crow and Stevie Wonder for whom over fifty FALCON 6000 CMY luminaires provided an attractive visual counterpoint. Further spectacular performances from the FALCON followed at the beginning of February. These included the National Football League’s Super Bowl XLIII, the highlight of the gridiron season, won surprisingly this year in the closing seconds by the Pittsburgh Steelers at the expense of the Arizona Cardinals. The game in Florida on the 1st February featured a half-time show again starring Bruce Springsteen. This was followed by another mega event, the 51st Grammys in Los Angeles on the 8th February. The lighting design for all three events was the responsibility of the American lighting designer Bob Dickinson, who explicitly requested luminaires from A&O for the productions. And not for the first time: Xenon searchlights manufactured by alpha one, such as the FALCON 6000 CMY and FALCON BEAM, have played a prominent role in a number of Bob Dickinson’s recent designs. In Germany, too, luminaires from the FALCON series are proving extremely popular with lighting designers and TV producers. 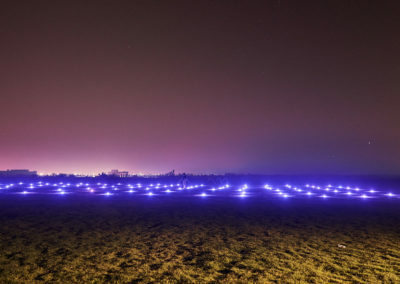 Cape Cross, for example, ordered fourteen FALCON searchlights for the hit TV show “Schlag den Raab”: Four FALCON BEAM 3kW and ten FALCON FLOWER 3kW units combined this season to illuminate the game sequences as well as show interludes featuring stars like James Blunt, Queensberry and Mando Diao. FALCON FLOWER luminaires are also providing visual highlights for another of Europe’s top-rated shows this season: RTL’s “Wetten dass…”, this time from Offenburg, as Seal and Coldplay took to the stage, it fell to eight FALCON FLOWER 3kW ordered by Voss Media Design to cast them in the best possible light.